Back in the early 80s the "maze" game was a popular genre both in arcades and on home consoles, featuring a fixed screen and expected mechanics of navigating a character around hazards whilst collecting objects. Once platforming and adventure games took off, the maze game all but vanished; even the king of mazes, Pac-Man himself, has long since become a platforming hero. 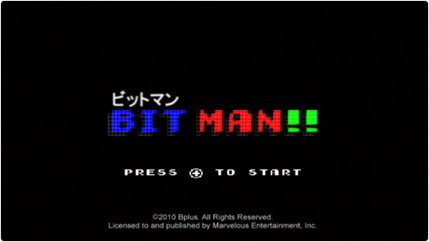 In 2009, Bplus released Bit Boy!! as an homage to the venerable maze game and a vehicle for touring the history of home console games with levels that change in look and gameplay to match the various gaming eras. Unfortunately we felt it didn't live up to the hype surrounding it, though the core concept was clearly compelling for a lot of retro gaming fans. Amongst those who saw the potential were representatives of Marvelous Entertainment who decided to make it part of their World Game Parade: a series of European WiiWare releases that are being localised for the Japanese market. The result of this partnership is Bit Man!! – a sequel of sorts to Bit Boy! !, which has successfully delivered on the retro promise of the original game. At first glance Bit Man!! seems to be the same as Bit Boy! 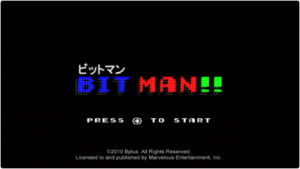 !, just with Japanese text and a different title: the music and the intro are the same and you'll find the six levels according to game generation with "bitness" assigned to distinguish them from each other (though not actually intended to represent the actual processing power of the CPUs of their respective generations): Bit Man (4-bit), Bit Man 2 (8-bit), Super Bit Man (16-bit), Bit Man 3D (32-bit), Bit Man 64 (64-bit) and Bit Man Wii (128-bit) are all still present in this game. Once you start playing you'll find that this is a different game in look and feel due to changes both overt and subtle that make for a more enjoyable and even experience than in Bit Boy! !, indicating the developers have clearly been listening to feedback from their fans. Each level has had some tweaks made to it. In general you'll find level designs are more maze-like: there are fewer dead-ends and those which do exist aren't the long corridors from the first game. More noticeable is that each level now only has seven stages with each divided into two phases, the second of which introduces additional challenges in later levels. This adds noticeably greater depth to the gameplay, making it more than simply running around rescuing Kubi's friends (though that is still your primary goal). The difficulty has also been tweaked, often subtly, which makes the game more challenging without feeling "cheap." In the first phase there are less enemies, and the enemies overall move at a slightly slower speed in the 8-bit and 16-bit stages. 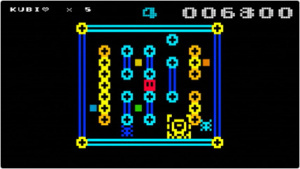 The second phase features a greater number of enemies with different movement patterns (most noticeable in the 3D levels), but adds new gameplay features to balance things for the player: in the 8-bit stages, Pac-Man-style lanes open up to provide escape routes, whilst the 16-bit stages, which start out much easier, introduce blocks that pop spikes out at regular intervals which will dispatch player and monster alike if they're next to them at the wrong time. Kubi Link battles the robot terror! We felt the 2D levels were the strongest part of Bit Boy!! since they had the best retro-feel and felt the most well-developed. 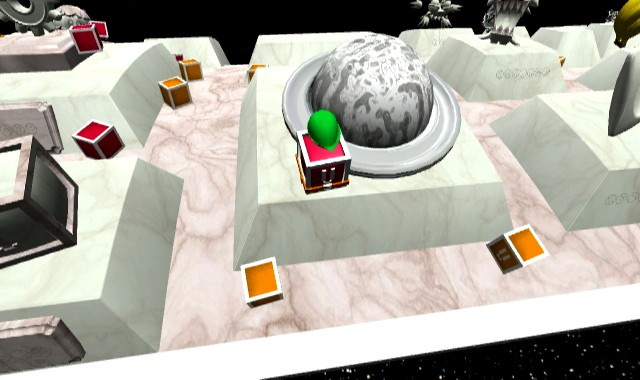 The 3D levels seemed too similar to each other and not as well thought-out by comparison and this is where Bit Man!! has made the biggest improvements. The dynamic camera has a slightly wider viewing angle and whips around less, such that we actually prefer playing with the default setting, though the option to change camera angles still exists for those who want an overhead view. More important is the change to the overall look of each of the 3D levels making them quite distinct from each other. Bit Man 3D is largely the same as the one from Bit Boy!! but with better level design; phase two of the 32-bit stages adds jeopardy in the form of fireballs that fall from the sky. The smiling and bouncing 64-bit stages introduce an exploding monster and a secondary weapon in the form of blue fireballs that can be launched to stun enemies temporarily – whilst they're still cute-looking cat-heads on springs they're a lot faster in Bit Man!! and there's more of them! 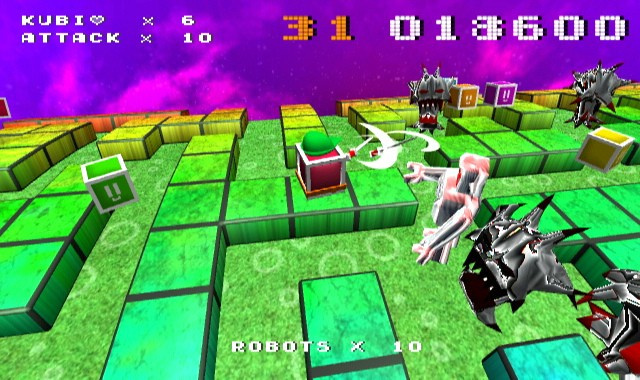 The 128-bit Bit Man Wii stages are the most dramatically different, with each stage having a distinct look mimicking the worlds of a Mario game; whilst Kubi wears a green feathered cap reminiscent of a certain elvish Nintendo hero and wields a sword in phase two of the highly-detailed, colourful stages. The seventh stage of Bit Man Wii is a nice homage to previous Bplus WiiWare games in the form of a marbled museum featuring statues of characters from them. These are far and away the most difficult stages of the entire game, not only due to more enemies wandering around with more clever wandering algorithms, but the treacherous edges of the playfield you can fall off of if you're not careful. Players can jump to elevated places with a remote shake as in the 128-bit Bit Boy!! level, only this time due to improved layouts and more menacing monsters you'll find yourself doing so both to collect friends and escape enemies. 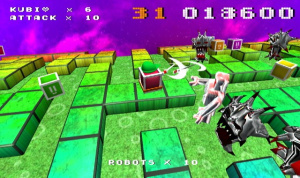 In addition to rescuing an ever-increasing number of Kubi's pals, players are also tasked with destroying robots which appear to have come from Vektor Tank. Whilst we like the variety this presents, the increasing number combined with their slow spawn rate drags things on a bit and trying to destroy 50 robots in the final stage becomes something of a chore. Nevertheless, the Bit Man Wii stages really do make a great conclusion to the game with varied and detailed settings surrounding some challenging old-time maze action. Welcome to the Bplus musuem – beware of robots! Of course there are still some little idiosyncrasies present, like Kubi (and some of his friends) starting out near the monster spawning point in each stage of every level; and that Mode 7 staircase is still in one of the 16-bit levels that you cannot climb back up (though thankfully there's no friend on it to rescue), but none of it takes away from what is a solid, fun retro title. As with Bit Boy!! you'll find that after you've gotten a high score on the leaderboard of each of the six levels, Warp Mode is unlocked (as is the "speed mode" played during the credits) – though this is no mean feat and took us several hours of play rather than the half hour Bit Boy!! required. Warp Mode is exactly the same as in Bit Boy!! : grab as many diamonds as you can for the best score with each death moving you to the next stage rather than depleting a pool of lives. If you manage to get one of the top scores in the Warp Mode for each level you'll unlock the new Master Mode in which each stage now has a third phase, making for an even more challenging experience than the default Classic Mode – especially since you won't have any extra lives or special attacks provided. That is AWESOME! Way to go Marvellous! I want it! Would be nice if it came here. @Pixelman, I should note that because this article is linked to the game data page for Bit Boy!! the screen shots below the article are actually from that game; not Bit Man!! Only the shots embedded within the article itself are from Bit Man!! With so many improvements made, I really wanna try it now:) Hopefully it'll "boomerang" back over here after it hits Japan. Call if Bit Boy Plus or something. Well, I'm glad to see they put an honest effort into addressing the problems found in their previous work. Hopefully this will turn out to be a more worthwhile game because of it. This game looks freaking awesome!!! I actually kinda liked Bit Boy. Sure, it's not perfect, but it's not as bad as everyone was saying. I can see how this improves things, though, and it's looking pretty good! Bit boy got OWNED by all the critics. I don't pay a lot of attention to them but, I have to say Bit Boy did look very lame to me, so I'll ignore Bit Man therefore. don't know if i'll be getting Boy!! or not, but if this comes out here, it's on my list for sure. cool, I skipped the first but could get liked the concept and could get this if it get released in the US. I wasn't too impressed by Bit Boy, and my $6.00 fueled this sequel. Redeem yourselfs with this one, guys!